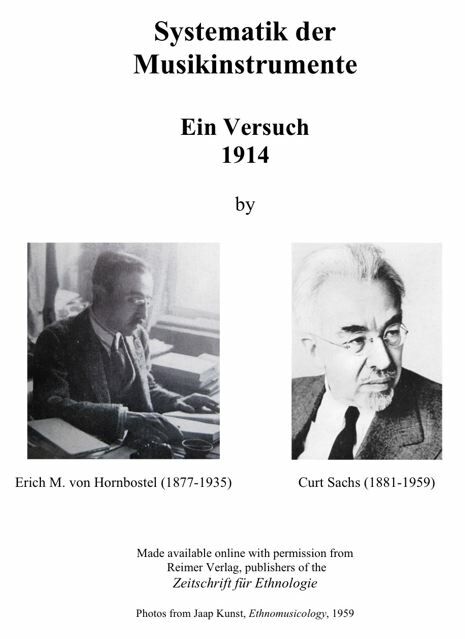 Erich M. von Hornbostel and Curt Sachs published their "Classification of Musical Instruments" in 1914. The English translation was published in 1961 in the Galpin Society Journal. The Knight-Revision of H-S, or K-Rev, is a result of a thorough rethinking and reworking of the H-S system to improve its usability. In H-S, numbers are assigned to instruments to create a hierarchy of classification. This approach is retained in K-Rev, but the numbers begin with a letter, and many changes have been made to the internal logic. The purpose is to better identify types of instruments, simplify the terminology, and incorporate new information. The three pdf documents below introduce K-Rev in a one-page outline, a two-page introduction that includes the outline, and the full 44-page K-Rev system. Click the image at right to download the original German document by Hornbostel and Sachs.